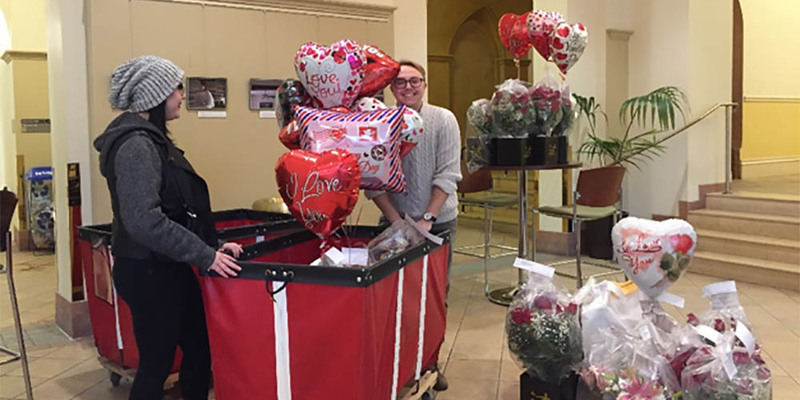 Flower arrangements and heart-shaped balloons filled the lobby of Lawrence Hall for Point Park's annual Valentine's Day delivery fundraiser February 13-14. Students loaded the University's red bins and walked to businesses in Downtown Pittsburgh to deliver the orders. The money raised supports the University's Fallon Travel Fund, which helps defray costs for School of Communication and Honors Program students traveling locally and abroad. In May, the Exploring the International Media and Professions class will travel to Italy. “I always love our flower delivery fundraiser because you get to brighten someone's day, and it's a simple way to raise money for the Fallon Travel Fund," said Nicole Pampena, a junior journalism major who will travel to Italy. The women’s soccer team and Coach Maggie Kuhn joined this year's effort to raise money for their operating fund. In total, 85 Point Park students delivered arrangements to more than 290 recipients, raising $1,600. "Point Park students spread the love with Valentine's Day deliveries," Pittsburgh Post-Gazette, Feb. 14, 2018.